As someone who often patrols the sylvan environs of North Kitsap, Deputy Shane Hanson’s had his share of run-ins with wild animals. But what his patrol cruiser’s headlights illuminated in the wee hours last Monday, no one could prepare for. 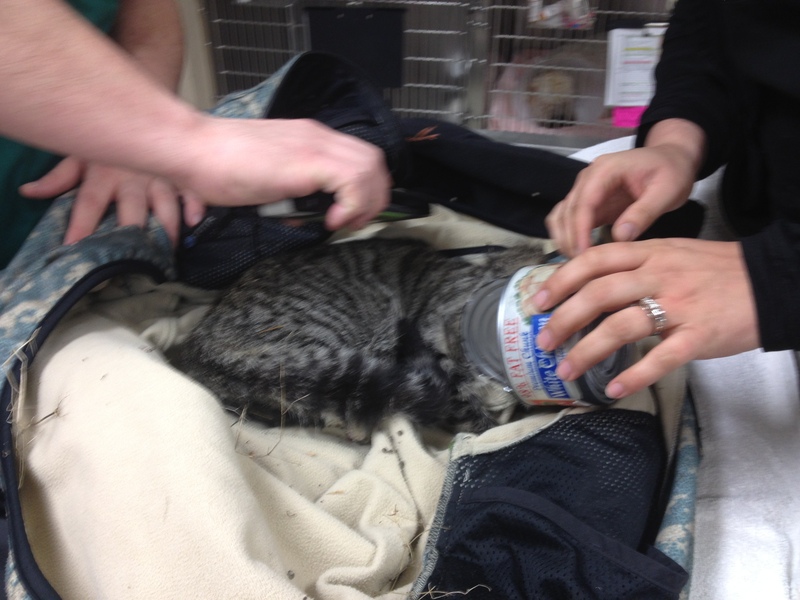 A black and gray tabby cat was wandering helplessly in the middle of Port Gamble Road, with something on her head. Hanson got out to take a closer look. He found the feline’s head was completely lodged in a can of tuna, blinding her and keeping her mouth forced open. He informed dispatchers he was going to check on the cat. Kept his words simple at first, so as to not raise eyebrows with his fellow deputies to start with. The cat could escape and his story might then be seen as far-fetched. “No one’s gonna believe this,” he said he thought. The first attempt to help the cat did not go well for the six-year sheriff’s deputy, who spent the first 11 years of his career as an officer on Bainbridge. When he got close, the cat lashed out, tearing her claws into Hanson’s ring finger and palm. Undeterred, Hanson regrouped and, a member of the county’s SWAT team, he grabbed his department-issued SWAT jacket as defense from kitty’s claws. The cat ran off several times. Hanson said he worried if anyone should see him, images of keystone cops would fill their heads. The cat went into a yard and surrendered. Hanson bundled the cat up. He asked some residents if they’d lost an animal; they said no. The vets’ surgery was successful in removing the can. I’m told that even a can opener was used to help in the extraction. Kitsap County Animal Control Officer Tyrus Edwards picked the cat — believed to be female — up from the center and took her to the Kitsap Humane Society. Aside from the trauma, the cat has recovered. Hanson, for his part, said he’s always liked animals — he’s more of a dog person, he admits — and hates the thought of them suffering. He said he was happy to help the animal and was pleased to hear she’s doing better. Rob Drought, the humane society’s feline coordinator, said she’s semi-feral, though and hopes she’ll go soon to a foster home to recuperate. Because she’s only around a year old, there’s a reasonable chance she could one day go home with a family. “I have a funny feeling we may be able to rehabilitate this girl,” Drought said. If you need any more reasons to get a locking mailbox, this lady’s purse should provide a plethora of them. 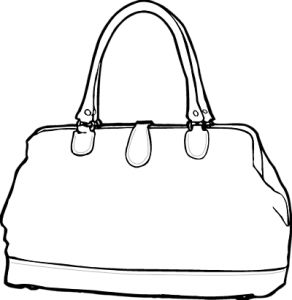 Here’s the scoop: The purse was left behind Feb. 5 by a woman fleeing Walmart in Port Orchard. She’d been spotted stealing computer software and when a store loss prevention employee intercepted her, she made a bee-line for a car, according to Kitsap County Sheriff’s reports. She dropped the purse in her flight. In doing so, she helped deputies solve a slew of crimes. And finally, the likely tipoff to just how she got hold of all this stuff in the first place: A notebook that had many addresses of estate sales and, most notably, addresses of where to “check mailboxes,” deputies said. Mail theft’s not a new phenomenon. You may recall a few years ago my story on a man who supported a meth habit by actually creating files for each person’s mail that he stole. Mail theft, from what I can tell by reading police reports from around the county, appears to be on the rise again. And they’re not just taking mail, but packages left on front porches (For instance, the package found in this purse likely falls in that category). A sheriff’s deputy worked to return all of the personal items found in her purse. And while she got away at Walmart, police eventually found the suspect (through a tip). She was booked into the Kitsap County jail early Wednesday, where she remains on $40,000 bail. Have I sold you on getting a locking mail box yet? It’s Super Bowl Sunday. A day for football. And, for a good number of fans around the Kitsap peninsula, it’s a day of drinking. Unfortunately, while most enjoy the day peacefully with family and friends, Super Bowl Sunday is also typically a busy day for law enforcement. The Kitsap Sun will take the opportunity to witness the law enforcement stress levels first hand Sunday night. I’ll head out with deputies from the Kitsap County Sheriff’s Office starting at 6 p.m. This page will have live updates via Twitter of what we see along the way. Please feel free to ask me questions through Twitter and I’ll respond whenever I can. However late it arrived on the Kitsap peninsula this year, summer appears to have brought with it an unfortunate trend: more home burglaries. I’d been suspicious that our area was seeing an uptick in break-ins, but was confirmed by data from the Kitsap County Sheriff’s Office and hearing the stories of some unfortunate victims. Tiffany Bridgeford’s home on Central Valley Road was hit May 3. The thieves took jewelry, electronics and other items. Also scary: her dog was home — she has no idea how they evaded the animal — and that they were in and out in just 45 minutes, she said. The sheriff’s deputies who investigated told her burglaries were on the up, said Bridgeford, who sadly has been a burglary victim three times in nine years here. Her neighbors, it would turn out, also had their home broken into last Saturday. The thieves took valuables, but — and this is the weird part — they also drank Coca Cola out of their refrigerator and smoked a cigarette in the residence. “They felt that comfortable in our house,” said Alena Menefee Dashiell, you lives on Central Valley with her boyfriend Richard Hemingway. The high water mark for break-ins was in August, with 81 around the unincorporated parts of the county, according to Kitsap County Sheriff’s spokesman Scott Wilson. Overall, here are the monthly totals: Jan.: 51, Feb.: 26, March: 48, April: 49, May: 67, June: 52, July: 71, Aug.: 81, Sept. (through its first third): 35. Both Menefee Dashiell and Bridgeford are looking at ways to better safeguard their homes. * Know your neighbors: Get to know the people around you so that when suspicious cars or people are in the neighborhood, you know who to look for — and who’s watching your back. * Get an alarm: If you’re one of those people in Kitsap or North Mason’s more rural areas where neighbors can’t help scan for burglars, get a computer to help you do it. * Have good visibility around the home: Keep trees and landscaping thin so burglars can’t scope your home without seeing them. Keep outside areas lit at night to help you do so as well. Oh, and don’t forget to report any suspicious activity to 911. And, you can always start a neighborhood block watch. For more information, call Kitsap County Sheriff’s Office Community Resource Officer Schon Montague at (360) 692-7746. The possible parole of the man who killed Kitsap County Sheriff’s deputy Dennis Allred in 1978 has galvanized his family and friends to organize on Facebook. A page has begun to rally support to keep Nedley G. Norman in prison long after his parole hearing later this year. Note: you may have to be logged in to see the page. “This page was created in an effort to gain support to keep my dad’s killer in prison. His killer was convicted and sentenced to death in October 1978. Since then, due to changes in the law he went from being on death row, to life without possibility of parole, and finally to a minimum 600 months (50 years) to life. After serving 33 years, the killer is up for parole in July 2011, due to the “justice system”. Please join us in gathering as many signatures from residents of Washington State-letting the Indeterminate Sentence Review Board know we want this killer to remain in prison for the minimum term of 50 years to life. A link to the petition is available to download. If you decide to help in this cause, please e-mail me with your information. I would like to keep track of those involved and making sure we gather all petitions that are filled out. Please forward the petitions to me by June 13, 2011-to make sure there is enough time for presentation to the Board. This effort is open to all citizens, not only Law Enforcement. This killer’s release not only affects me, my family, and law enforcement members, but everyone in our community. 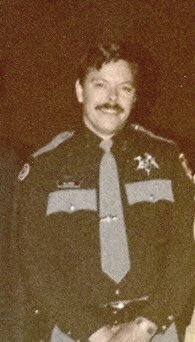 “Around 11 p.m. April 19, 1978, along a rare flat stretch of Illahee-Brownsville Road, Kitsap County Sheriff’s Deputy Dennis Allred became the only law-enforcement official killed in the line of duty in Kitsap County. Allred had stopped a truck towing an engineless car. As he spoke with two occupants of the truck, James Stemkowski and Steve Richards, an unseen third occupant, Nedley G. Norman, shot Allred twice in the chest and then walked to his fallen body and delivered a fatal shot to the head. The trio, who were towing a stolen car, fled the scene but the next day, Stemkowski turned himself in, breaking the case. It was a killing that shocked Kitsap County. A member of the sheriff’s department for less than three years, Allred’s funeral in Bremerton drew representatives from law enforcement agencies throughout the state and country, as well as thousands of local residents. That death sentence began a life sentence and then, that life sentence became a possible parole sentence. Ryker, a German Shepherd that has long tracked down suspects of crimes in Kitsap County, has died. 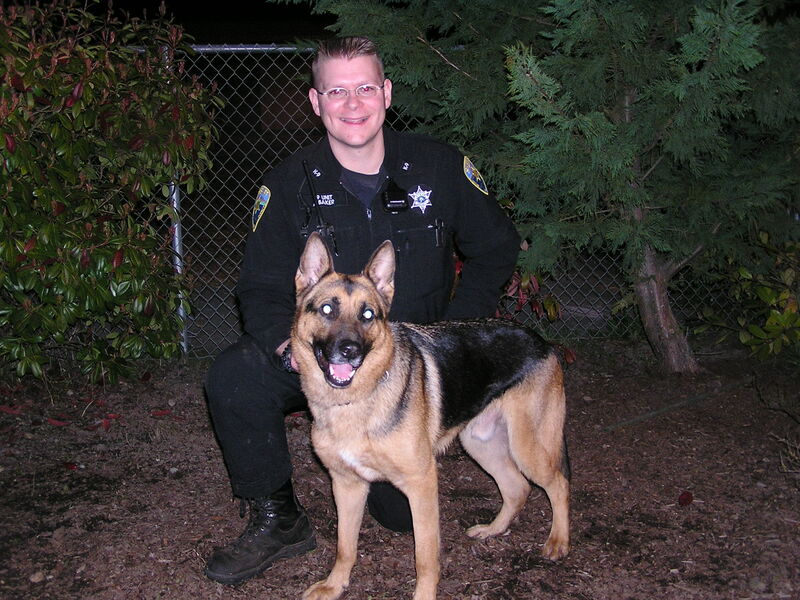 Ryker, long the partner of Kitsap County Sheriff’s deputy Aaron Baker, joined the sheriff’s office in 2002. You can read the story about Ryker here. While somewhat dated, here’s a list of K-9s in the service of law enforcement on the Kitsap peninsula. Bremerton Officer Brian Johnson, and his dog Tabor, retired last year. ‘Tis the season, unfortunately, that thieves are targeting those presents you send through UPS and other delivery services. Port Orchard Police Commander Geoff Marti says that three people at different addresses — two on Gleneagle Avenue and one on Wexford Avenue — have reported their packages have been stolen right off their front porch. Marti points out that this may be a vastly under-reported crime. For one, some packages are a surprise and thus the recipients may not even know they’re getting it. Such opportunity crime is nothing new, unfortunately. But the culprits could be resorting to new lows, Marti said. “It would be reasonable to believe that delivery trucks may be followed by the perpetrators,” he said. Marti recommends that if you know you’re getting a package — or sending one — track your orders and try to be home when they arrive. Having packages delivered to your work address works too. He also suggests watching out for such criminal activity. CASE BACKGROUND: Closing arguments are slated this morning in the trial of Daniel J. Mustard, 19, accused of stabbing to death 87-year-old Ruby Andrews in South Kitsap on April 5, 2009. He faces a life sentence if convicted of first-degree premeditated murder or a commitment at Western State Hospital if acquitted. Closing arguments are slated to start about 9:30 a.m. or so. On Tuesday night, Bainbridge Island police shot and killed an ax-wielding man, according to the Kitsap County Sheriff’s Office. In February, Suquamish officers opened fire on a man who drove a car at them on Nelson Street. The shooting was justified, according to the Kitsap County Prosecutor’s Office. In July, a Poulsbo officer on a traffic stop in Silverdale shot and killed a Bremerton man who police said was reaching for a gun. That shooting was also ruled justified by the prosecutor. In September, an off-duty Washington State trooper at his home in Olalla shot and killed a man who’d hit him in the head with a steel rod. That shooting remains under investigation. In early October, a Mason County deputy was hit in the leg with gunfire following a chase in Allyn. Though the investigation is not complete, early reports indicate a deputy had fired a shot at the suspect’s car after he’d begun using it as a “deadly weapon,” according to the sheriff’s office.